The Chickens are well and truly established at Booyong, we love them, and they are such an important part of the property. We initially bought five hens to fill our new chicken coop and were gifted a new rooster to accompany them. Sadly, our Rooster Garie Obama is no longer with us as he hurt the female chickens, thus the current lack of feathers. Since this has occurred we have learnt that it is often necessary to separate the rooster from the hens during Spring. We hope to get a new one in spring to continue to protect the hens. We’re lucky to have Bob our caretaker to hand pick the chickens and build a lovely coop with the assistance of Poppy and Jack. 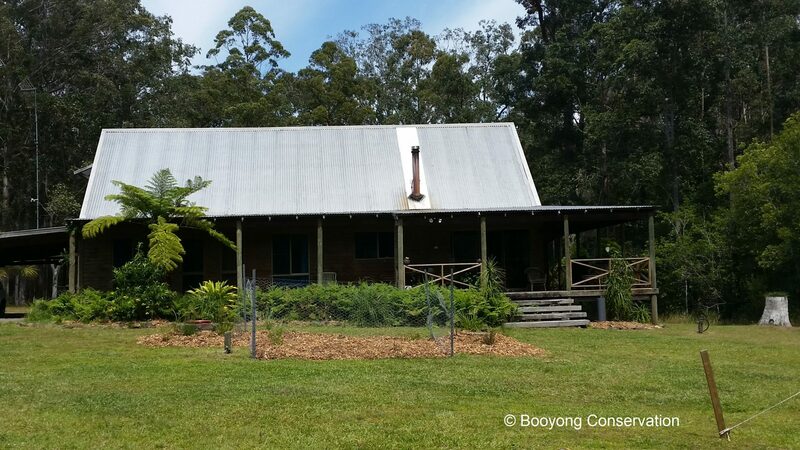 It certainly exceeds any regular expectations, with its brass door knobs, a timber deck that overlooks the dam, timber perches and it even has floral windows! Mesh has since been placed around the lowest area of the henhouse to keep snakes and rats out. Chickens require 1m squared of floor space per bird, dust for bathing and seclusion for laying. The nest boxes are required to have 10cm of litter and should always be kept fresh. Nest boxes are in a cool dark spot and one box per 5 hens is enough. The nest box can be lined with pine needles, dried grass, wormwood or herbs. It is also very important to keep the henhouse clean, painting the floor can assist making cleaning easier. The floor of the hen house should be topped up every 2 months with shredded paper, rice hulls or wood shavings. Twice a year it should be cleaned out and the floor sprinkled prior with DE Diatomaceous Earth ($29 for 5kg) and Chicken litter can be added to the garden as mulch or placed in the compost. During the Winter months the hens will prefer high perches to keep warm, and in the summer months they prefer to perch closer to the ground. The perches should be brushed regularly to keep them clean. Ventilation in the roof is also beneficial and something to consider for the future, especially given the hot and dry weather the past 12 months. In summer it’s important not to remove the litter as the hens will scratch deep into it on hot days to cool down. They also benefit from shell grit in their food and it is important to provide additional water. Birds are often eating the chicken feed at Booyong, this is concerning as they can spoil the feed and introduce disease and parasites. I recently saw a gardener had placed fishing string across the roof or the henhouse to deter birds, sounds like a great idea. Solar panels are also often used to keep electric fencing in place, something to explore in the future. The yard also has a mulberry tree to provide shade and feed for the chickens, they thoroughly enjoyed the fruit this year. 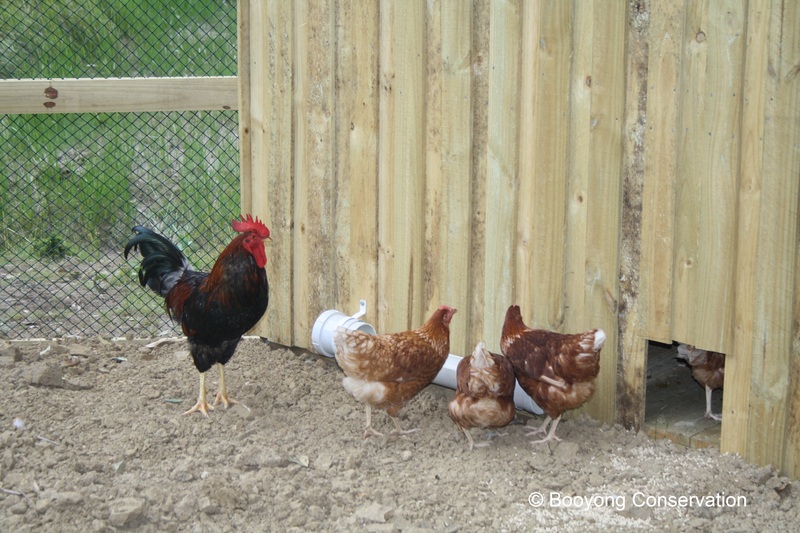 We would prefer the hens to be free ranged and often let them out when Bob’s not looking. He prefers them to stay in the henhouse as they destroy his garden beds. Weeds can be recycled by tossing them into the chook pen, this also gives them the opportunity to scratch about. Chickens are susceptible to red mites who eat chicken food and produce rapidly in the Summer months. Water and food containers should be rotated to keep clean and during summer months frozen water bottles can be added to their water containers to jeep it cool. We’ve done some research regarding what they eat and what they don’t. The chickens are still getting used to the food scraps we give them, but had no trouble with high protein pellets we purchased from the co-op. They also benefit from shell grit ad chicken pickings. The RSPCA say they eat almost anything, but what they can’t consume is rhubarb, avocado, onion, chocolate, garlic and any citrus fruits Scraps should be broken or cut up into small pieces as chickens don’t have teeth.. They also mustn’t be fed lawn clippings, as they can go mouldy very quickly. Chickens benefit from wormwood planted outside their coop, they also enjoy home grown amaranth, sunflowers, chicory, millet, alfalfa and salad greens. Our bantam chickens have become accustomed to their new home and are now supplying fresh eggs daily. We encourage anyone visiting to keep their food scraps, avoiding those listed above feed the chickens during your stay. We will create a track from the house to the coop so you can visit the hens, and feel free to take a few fresh eggs of a morning and enjoy them for breakfast.